The Quadra Safar rod series includes 5 models of 4 piece travel rods. 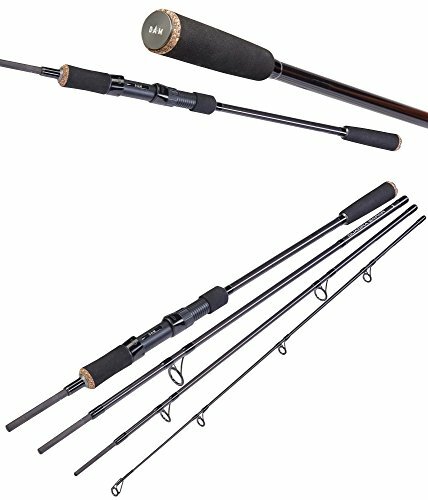 These rods covers all types of fishing from light to medium heavy. The stiff blank actions and the double legged guides make the Quarda Safar suitable for spinning and fishing with natural bait as well. Each rod comes in a solid PVC tube that protects the rod during transit. A great travel rod series that leaves no wishes open. Features: High quality TC24 carbon blank, Strong guides with black finishing, High quality EVA fore and reargrip, Fast action. High quality Travel Fishing rod by DAM. Fast action. Comes in a Plastic tube. If you have any questions about this product by DAM, contact us by completing and submitting the form below. If you are looking for a specif part number, please include it with your message.